Managua, Nicaragua – Embattled Nicaraguan President Daniel Ortega, battered by two weeks of street protests so violent many of his political enemies are openly saying he’s lost control of his government, offered an impressive show of strength in rebuttal Monday, leading tens of thousands of supporters in a pledge to “say yes to peace!” at a huge street rally. 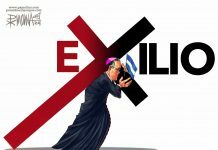 “We must say no to death, no to destruction, no to violence, no to barbarity!” Ortega said, leading his supporters in raising their hands as if swearing an oath. “Yes to life, yes to dialogue, yes to work , yes to peace!” The crowd roared in mighty approval. 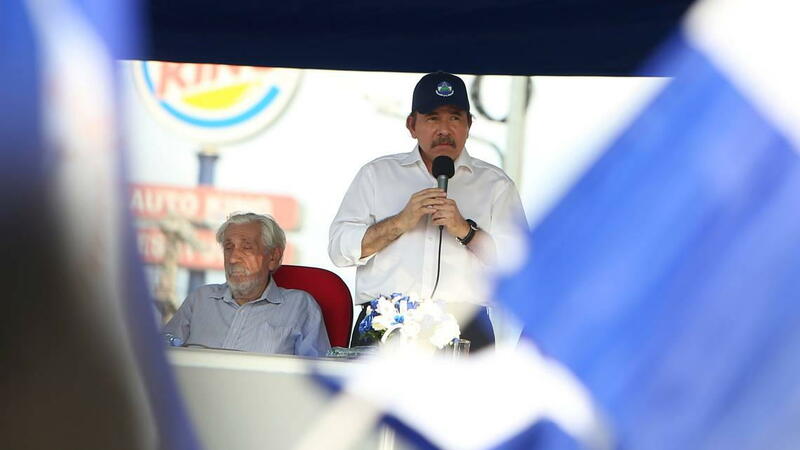 Nicaragua’s President Daniel Ortega speaks to supporters in Las Victorias square in Managua on Monday. Photo Alfredo Zuniga AP. 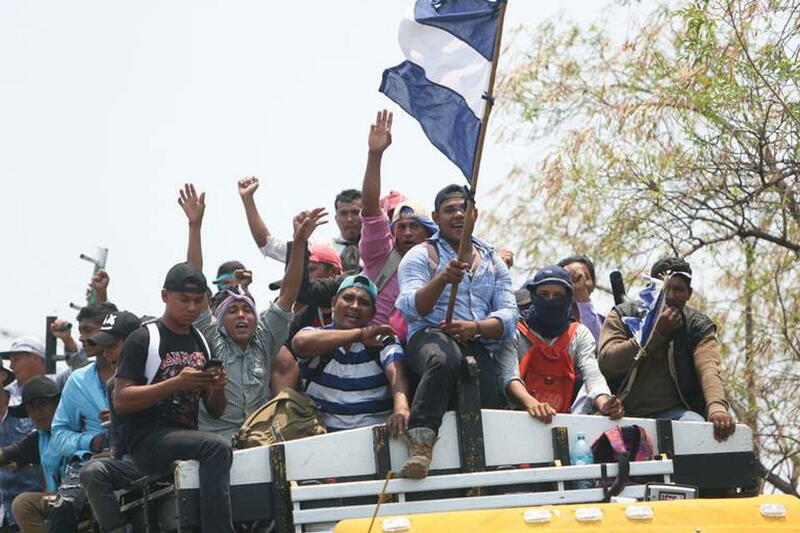 Ortega’s supporters mounted the rally in response to a chain of Saturday demonstrations across the country demanding his resignation — the biggest of them, with a crowd as big as 150,000 by some estimates, just a couple of miles down the street from where the Sandinistas gathered. 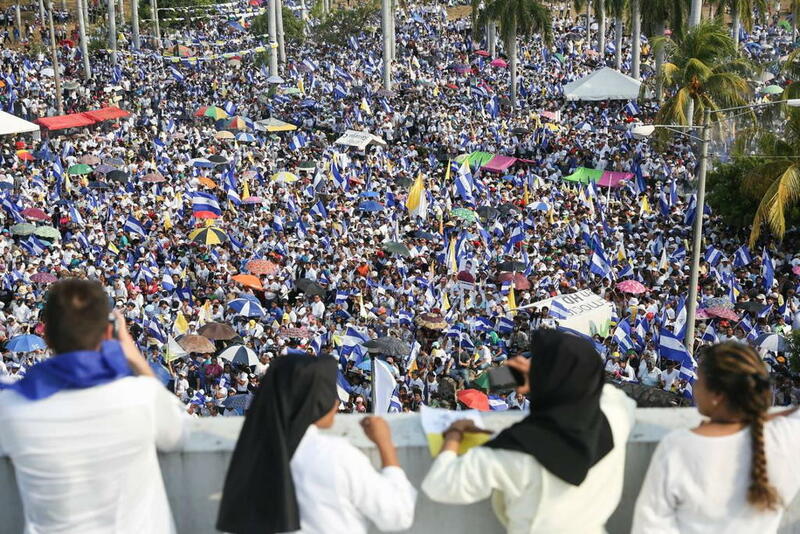 Ortega needed “a sea of people” to show “the love and care that we have for our undisputed leader,” the Sandinista communique announcing the rally said, and he certainly got it. 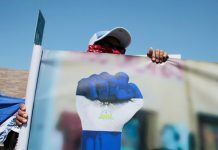 While Ortega’s demonstration was not nearly as big as that of the opposition — and certainly included some ringers, government employees ordered to attend — it was nonetheless an impressive achievement. His supporters filled a small plaza on a traffic circle near the Hilton Princess Hotel on the capital’s south side, the crowd extending out for blocks in all directions along the four streets exiting the traffic circle. Except for Ortega’s somewhat meandering but popularly received speech at the end, there was no talking, just singing and dancing along to some four hours of recorded music. Many of the songs were old party hymns from the 1960s and 1970s, when the Sandinistas were a guerrilla group fighting to topple Nicaragua’s decades-old Somoza-family political dynasty. Old Sandinistas in the crowd sang reverently along to the tunes on Monday, some with eyes looking off into a distant past. 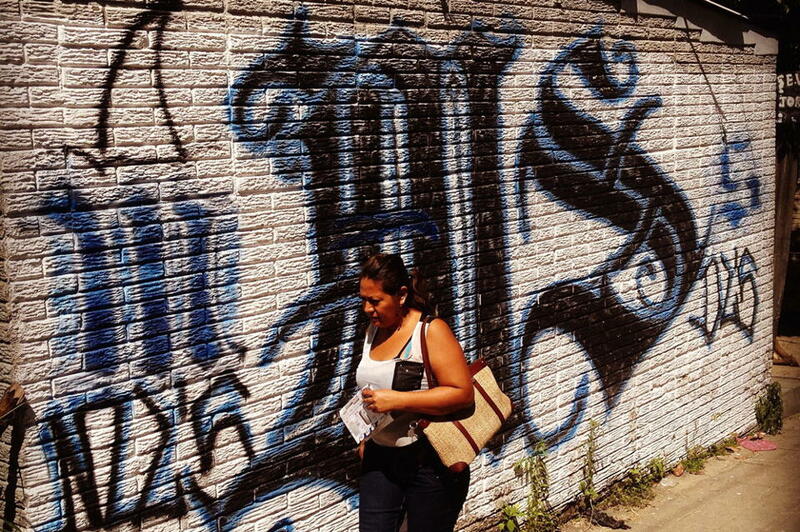 But there was also music clearly aimed at Nicaragua’s here and now. The DJ played at least 10 Spanish-language versions of the old Ben E. King record “Stand By Me,” an anguished plea for loyalty in the darkest night of the soul, as Ortega’s supporters sang along in obvious comprehension. And more than a few members of the crowd looked like they would rather be anywhere else, sullenly refusing to talk with reporters about how much they supported the government. “Go ask that woman waving the flag,” snapped one, pointing at a demonstrator wildly waving a black-and-red Sandinista banner. 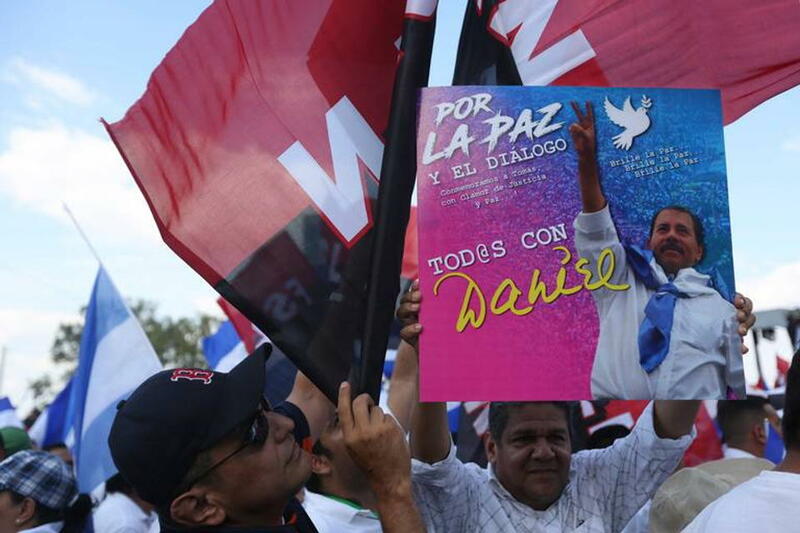 Like the opposition rally on Saturday, the Sandinista rally was completely peaceful. The 19th Of April Student Movement, an umbrella organization for the many small student groups who’ve traded punches with Sandinista supporters and — and, in dozens of cases, been fatally gunned down by them — had promised to stay off the streets until Wednesday and kept its word.